This Catalogna Chicory salad uses the tangy grapefruit segments to play off the mildly bitter chicory. Catalogna Chicory greens (also known as Italian dandelion) consist of several closely related leafy vegetables in the composite (Asteraceae/Lettuce) family. The plants may have originated around the Mediterranean region and Asia minor areas. It has been cultivated for centuries for its leaves, flowers, and roots; culinary as well as medicinal uses. There are several varieties of chicories. Considered the most important Italian variety of large-leaf chicory, Catalogna Chicory (also known as Radichetta) is grown for its succulent stems and tart, dark green, dandelion shaped leaves, which may be slightly or even extremely serrated. In colder months, its deep green leaves are crunchy and sweet and only moderately bitter. The dressing can be made and refrigerated up to 3 days in advance. Bring to room temperature and shake to re-emulsify before serving. Trim off the end of the stems ends of the chicory leaves. Chop the leaves into 2-inch pieces. Wash and rinse the leaves in a bowl of cold water and spin dry, and move to a mixing bowl. Mix the onion, salt, and vinegar in a small bowl, stirring to combine. Let the mix sit for 10 minutes, then whisk in the oil to form an emulsified dressing. Season with pepper. Toast the pumpkin seeds by warming them in a skillet over medium heat, occasionally stirring, for about 5 minutes, until lightly browned. Cool completely. Toss the chicory with all of the dressing. 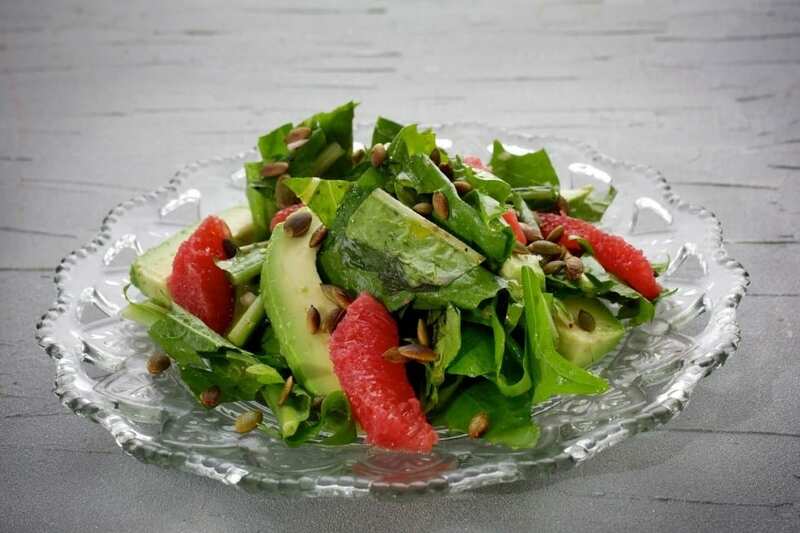 Place the chicory salad onto individual plates, and nestle the grapefruit sections and avocado among the greens. Sprinkle the toasted pumpkin seeds over the Catalogna Chicory salad. Season with more black pepper.